Not really into bugs, outdoor “restrooms” or lukewarm canned beans? You can still enjoy the awe-inspiring glory of the great outdoors thanks to “glamping,” the glamorous way to camp. 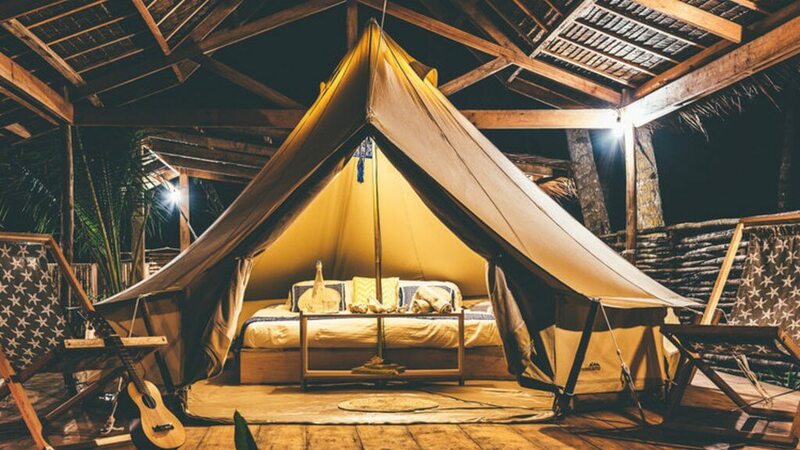 Glamping sites have been giving people fun vacation ideas and popping up across the globe in recent years, and many of these one-of-a-kind accommodations are much more affordable than you might think. 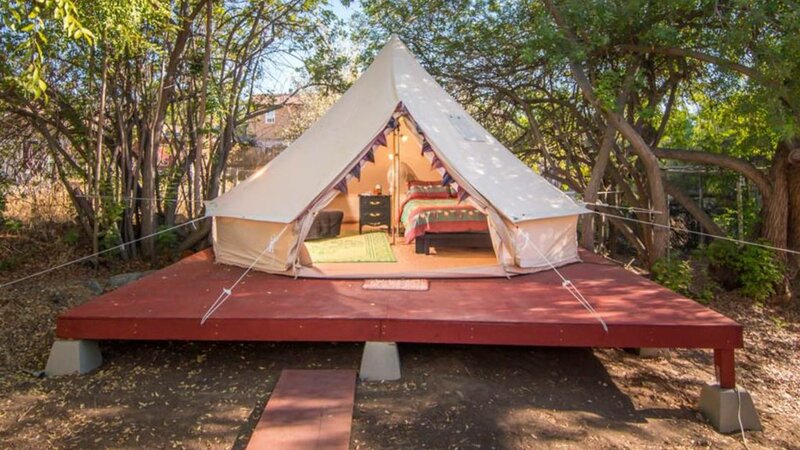 Fortunately, booking site Glamping Hub has rounded up 10 places for cheap outdoor vacations in the U.S. and abroad where you can glamp for $75 or less a night. 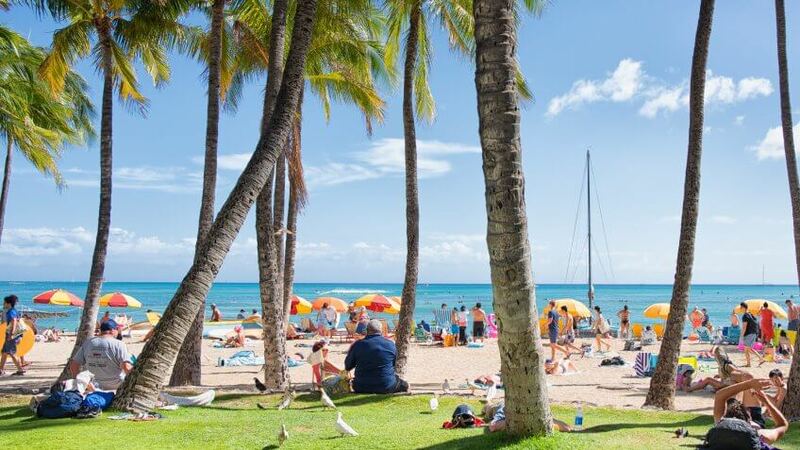 Consider one of these outdoor escapes for your next vacation. 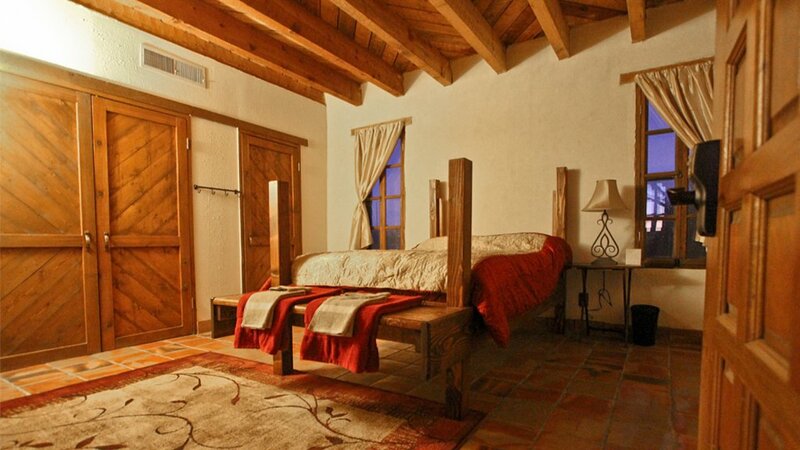 This cave-like rental can sleep up to three guests and is located near several places to climb and hike. With this luxury camping experience, there’s a full bathroom, plus a full kitchen and an outdoor barbecue, so you can enjoy the outdoors with all the amenities of indoor living. These wooden bungalows can sleep two to four guests, depending on the size, and all come with a private balcony with lake and mountain views. Each hut has its own hot shower and a minibar, as well as fans and heaters to keep the temperature comfortable depending on the time of year. A full breakfast is included with your nightly stay. Guests who stay in this colorful tent have access to a private hot tub, as well as a shared pool and barbecue. The tent comes furnished with a queen-size bed and a single bed, and sleeps up to three. Perfect for a romantic escape, this bell tent is furnished with a queen-size bed and can comfortably sleep two guests. Each tent comes with its own private deck, and guests have access to shared bathrooms and an outdoor lounge area. 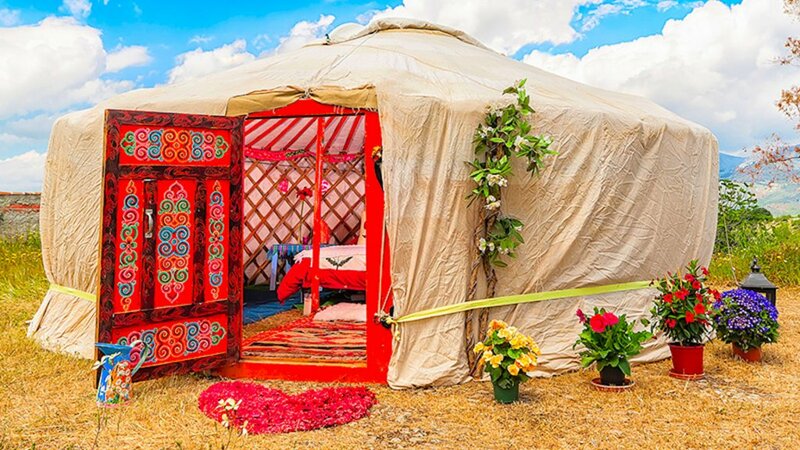 Sleep under the stars in this Spanish yurt, which can accommodate up to two guests. Yurt guests have access to shared bathrooms, as well a farmhouse on the property that houses a communal lounge, fully-equipped kitchen, Wi-Fi — plus a washer and dryer. Glampers can also enjoy mountain views while taking a dip in the property’s saltwater pool. You don’t have to spend a lot to relax under the Tuscan sun in these luxury tents. Each tent has a double bed and minifridge, and can sleep two guests. Note that linens and towels are not included in the rental, so you will have to provide your own. 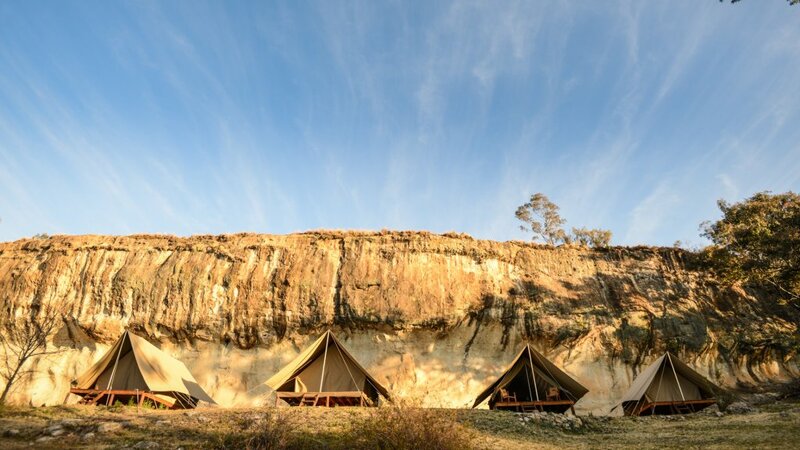 This glamping site includes 14 safari-style tent units and can accommodate up to 28 guests. Each tent has two single beds, as well as a luggage stand and chairs for lounging — and are adorned with Persian rugs. Guests enjoy access to a cave-like lounge and dining area, along with an outdoor kitchen. There are also toilet and shower facilities, as well as a “bathhouse” that has four outdoor Victorian-style bathtubs, so you can soak under the sun or stars. Enjoy the fun of staying in a tent — plus all the amenities you’d get in a hotel — with these deluxe cabins. Each tent house includes a shower, LED TV, minibar, air conditioning and a hairdryer — and three of the seven tents on the property have their own personal Jacuzzis. No matter which cabin you stay in, you’ll get gorgeous lake views. 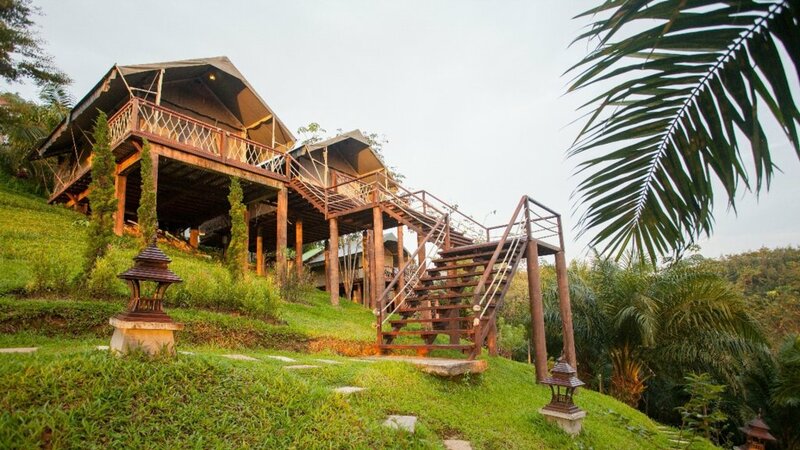 Stay in the jungle — while staying connected to Wi-Fi — in these Thai-style luxury tents. Each tent has air conditioning and a refrigerator, as well as a private balcony with panoramic views. There is also a restaurant and laundry service on-site. This charming adult treehouse can sleep two guests comfortably in its king-size bed. The yurt has electricity, plus an electric heater, and it’s surrounded by a large wooden deck with plenty of space to relax in a hammock or dine al fresco on the picnic table while taking in tree-filled views. Glampers have access to a communal kitchen, bathroom facilities and a communal dining area. Click through to read more about how one family goes camping without spending a thing.